A generic photo of 20- and 50-round boxes of one of Littlestone Ammunition's loading of a cartridge with a Cast Performance Long Flat Nose bullets. Hover cursor or click on photo for close-up view. Firearm not included. 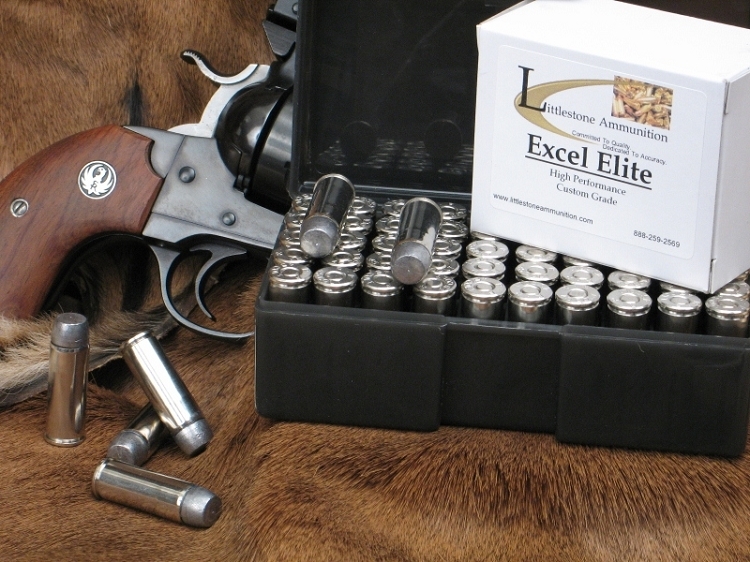 Deliver bone crushing, deeply penetrating power on large game from your .480 Ruger with Littlestone Ammunition's Custom-Quality Excel Elite loading of the Cast Performance Long Flat Nose Gas Checked lead bullet. Delivering more than 1,691 foot pounds of energy with a muzzle velocity of 1,425 fps, this 50 rounds is sure to drop 'em where you want. Accurately shooting a revolver at significant range is difficult enough, so make sure you have the most accurate ammunition possible. This ammunition contains powder charges that are regularly hand weighed for precision and the cartridges are assembled to extremely tight tolerances for maximum accuracy. Cast Performance bullets are lead bullets molded from Lead Bullet Technology (LBT) style molds. They are cast from virgin alloy and hardened to a Brinell Hardness of 18-21. They penetrate deeply and do not fragment on bone. LBT style heat-treated solids are rapidly becoming the standard by which all others compare handgun-hunting bullets. This design of bullet does not depend on expansion as do soft point and hollow point bullets, but in fact the performance level achieved by the LBT design is far superior to conventional bullets. Though this also is a flat point gas checked bullet, the front is not quite as wide as the other CP bullets and if driven at equal velocity it will penetrate somewhat farther than the wider nosed versions of the bullet if weight and caliber are the same. Feature 3: MV / Energy / Barrel: 1,425 fps / 1,691 ft lbs / 9.5"